As you’ve probably figured out by now, we are big noodle fans! 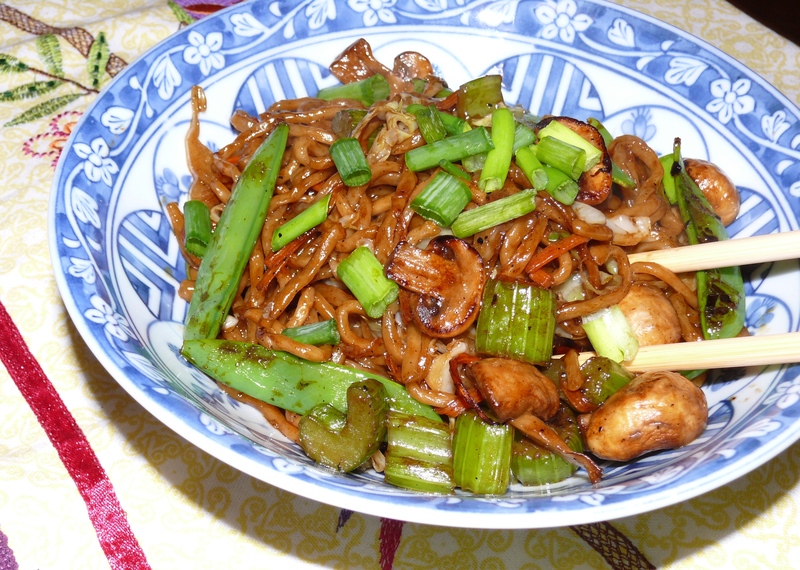 This recipe for vegetable soy sauce chow mein is supreme comfort food for me. It has a simple flavor profile, the main flavor being soy sauce. Sirachi is served on the side. I used quite a bit of dark soy sauce which gave these noodles their color. It isn’t necessary, but I do like the flavor the dark soy sauce lent to the dish (we have Pearl River Bridge Superior). I might try similar noodles again with just the regular soy sauce to see how they differ. The reason I remove the vegetables before cooking the noodles is because the trick to stirfry is super high heat and you just can’t get very high heat on a home stove, therefore I do everything I can to make it hotter: less ingredients at a time=higher heat! Add fresh chow mein noodles to boiling water and cook for just a couple of minutes. The water will not start boiling again. Rinse well with cold water and let drain. Heat oil in a wok and heat for a few minutes to get really hot. Add the celery and stirfry for a couple of minutes, then add the sugar peas and stirfry for a minute or so, then add the mushrooms and stirfry until they start to get tender. Add the carrots and cabbage and stirfry until wilted. Sprinkle on a little salt, stir and remove vegetables from wok. Heat the remaining oil in the wok and again heat for a few minutes until it gets really hot. Add the well drained noodles and fry stirring constantly until they dry out a little. Add in the vegetables, soy sauces, oyster sauce, sesame oil and sugar and toss to coat all the noodles. Serve in big bowls, top with green onions and sirachi on the side.